We rent our best bike blender, the Fender Blender Pro (High Performance), for $300 per event day. Each comes with a commercial-grade, NSF-rated 48 oz blender pitcher, the same kind in use at smoothie shops. Extra pitchers can be rented for $20, and we recommend extras so you can increase the throughput of the activity. Please see our helpful guide on estimating how many bike blenders and pitchers you’ll need for your event. You will receive the bike a day before your event, and return it the day after your event. If your event falls on a weekend your rental will arrive the Friday before and ship back the Monday after. If you’d like to receive your bike earlier, or need time to re-pack and ship after — rather than the standard 1 day we provide — an Extra Day can be added for an additional $50 / day per bike. The Fender Blender Pro will need a 10′ x 10′ space minimum, as well as a table to prepare ingredients. This space will fit one bike, 1 – 2 crew, a table, and some extra space for spectators. Bay Area Rentals: Pickup v Delivery. For rentals in the Bay Area, the client is responsible for pickup and return of gear, unless they are paying for delivery/pick-up. There is no charge to pick up a day before your event and return the day after. Our main pickup location is our workshop in Oakland (6323 San Pablo Avenue), but we can also arrange pickup in San Francisco at one of our homes (Mission District or Bernal Heights) for a $75 fee, assuming our staff are in town for your required dates/times. When you pick up your bike we will give you a quick lesson on the bike and help you load your vehicle. For information on what kind of bike rack you’ll need, please see What kind of bike rack should I use? 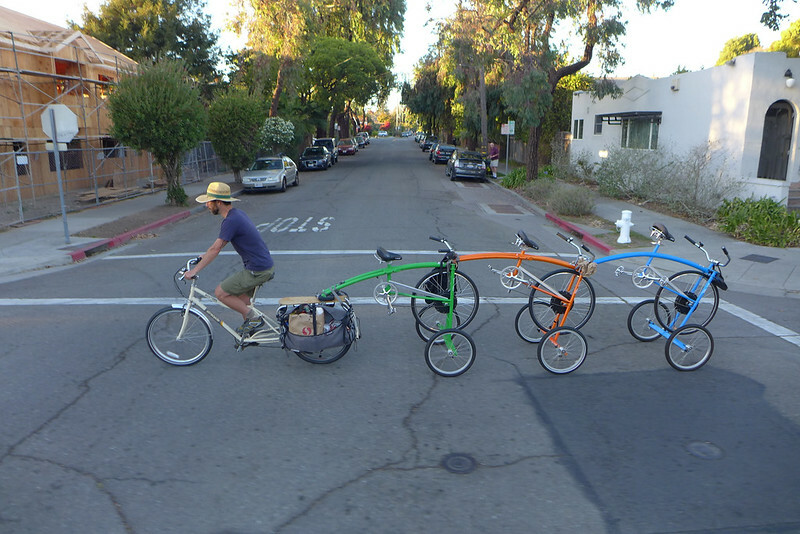 We encourage you to try bike towing with your rental bike. It’s fun, safe, practical and great for the carbon footprint of your event. Any bicycle with a rear rack can tow the Fender Blender Pro. There is no extra rental charge for the trailer wheels and hitch. Our delivery fee starts at $150. Delivery includes a overview of the bike and tips for a successful event. For deliveries in San Francisco, Berkeley, and Oakland, we are likely to get it there by bike as shown above, no trucks or loading docks needed! The bike easily fits through most doorways and elevators at your location. Delivery also possible in the greater Bay Area by vehicle. Our delivery radius is about 40 miles before we will only be willing to serve you with a crewed smoothie booth, or offer shipping (see below). Delivery is a special service that requires coordination among our team, and is harder to arrange last minute. Please give us as much advance notice as possible. Availability of delivery services is not guaranteed, but we have also not said no many times! + a packaging fee of $85/bike (higher if you use a pallet). + a distance fee to account for time this rental unit will be away from our shop. Up to $200 per bike for an East Coast address. If this cost is too great for your budget, we recommend purchasing a FB Universale, which starts at $249 + shipping. Unfortunately, we do not rent the Fender Blender Universale. Ship your rental on a pallet anywhere in the Continental US and receive your Fender Blender Pro ready to blend, no assembly necessary! Contact us today to get an estimate (please provide a destination address). Pallet packaging is $120 for up to 2 bike blenders, or $150 for 2 pallets 3+ bike blenders. Rock the Bike can supply experienced crew members who can cover all aspects of this activity. We’ll bring the bike, coach the activity, and ensure higher volumes at your event. The crew fee is $900 / day* for the first crew member and $600 / day* for each additional crew member. We’re fun-loving and outgoing event people. We’ll make sure the smoothies are sweet and tangy, and that everyone gets a chance to pedal. *Note: Crew fees assume that the time on-site will be 8 hours or less and they do not include the cost of ingredients or cups. We can bring smoothie supplies and serveware for a fee, or you can provide them by using our sample shopping lists for guidance, whether you plan to hand out 100 smoothies in two hours or 500+ smoothies over two days. Please go here for more information on hiring Rock the Bike to crew your event. We offer full vinyl custom wheel wraps for rentals, and they are quite eye catching. The fee for printing graphics, installation and post-event removal is $450 per bike. Artwork must be received in print ready format. For an additional fee, Rock the Bike can assist with graphic layout, design and include a rendering proof. Costs of graphic design depend on what the client can provide, and what the desired outcome entails; it can range from $300 – 600 accordingly. Need ideas for bike blending? Check out our recipes here. If you fall in love with your Bike Blender, and we think you will, you may purchase it from us! You must let us know immediately (within 1 day of your event’s end date) that you intend to purchase the bike, and the full cost of your rental will go toward the purchase. The remainder must be received within 5 business days. Failure to pay within that time frame will result in late fees ($100/day). Email us using the below form to see if we can accommodate your event. If so, we’ll get you a Rental Agreement and request payment in full. Bikes are rented on a first come, first served basis. We recommend contacting us as soon as possible to lock in your rental and frame color preferences. Have a credit card handy; we require a card kept one on file to process and ship your rental. NOTE: You may be subject to shipping and/or processing fees if you change your shipping location after you have already made full payment on your rental. Each Bike Blender rental comes with one blender pitcher included at no additional cost. Would you like to rent any additional blender pitchers for $20/ea? If so, how many additional? If you don't intend to blend with the bike, use "0" below. Want to also receive an Event Hire quote for RTB to staff the Pedal Powered Station? Note, not all events are eligible. Some inquires may require additional questions answered before a quote can be provided. Compare our Fender Blender prices, and see what other pedal power equipment is available to rent from us.